Unlike the majority of America, I’m not on board the Pumpkin Spice Latte Express. Yes, I like pumpkin. And yes, I like pumpkin spice things. More like pumpkin muffins, breads, pies, etc…; I like traditional pumpkin spice things. I don’t have to drink it in coffee form to enjoy it. I am however, completely on the Buffalo Chicken Flyer. Pretty much any kind of buffalo chicken food item, and I start to drool over it. Buffalo chicken mac n’ cheese, buffalo chicken pull apart bread, buffalo chicken dip, buffalo chicken meatballs… Well… you get the idea. Frank’s Hot Sauce and I have quite a special relationship, truly. I can’t always spend loads of time on making said buffalo chicken things, and me being a healthy, exercise-y kind of girl, I tend to eat salads. A lot. A lot of salads. So one day, after I had made a huge portion of shredded crockpot buffalo chicken, I looked in my fridge to store it, but saw 3 heads of romaine lettuce that would have to be eaten in order to store the chicken. Darn! That meant I needed to make salad. What dumb luck on my part. “Brilliant!” I said to me, because talking back to myself seems to be a thing I do. 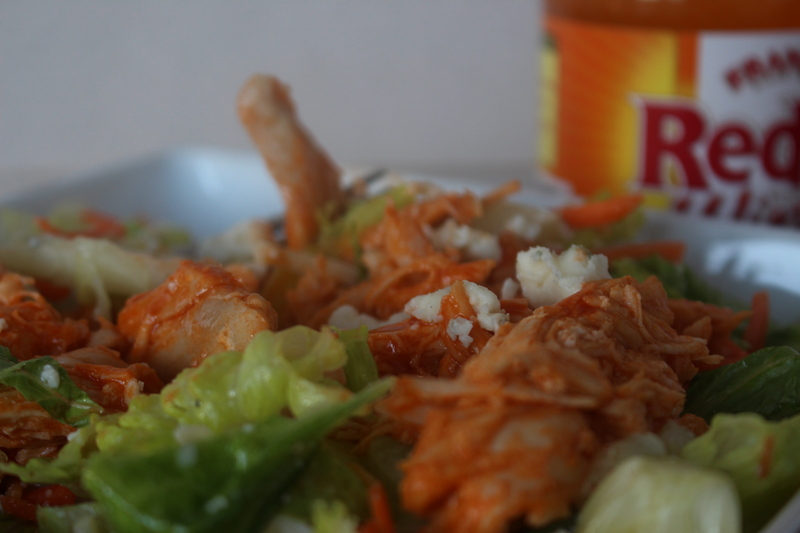 At the time, I had Ken’s Blue Cheese Vinaigrette on my pantry shelves (I’ve since tinkered around to make my own), so I grabbed some lettuce, celery and carrots (because they’re always served on the side with buffalo chicken wings at restaurants), and threw a bit of cheese and shredded buffalo chicken on top. It’s become my daughter’s favorite salad in a rotation of about 11 staple salads. 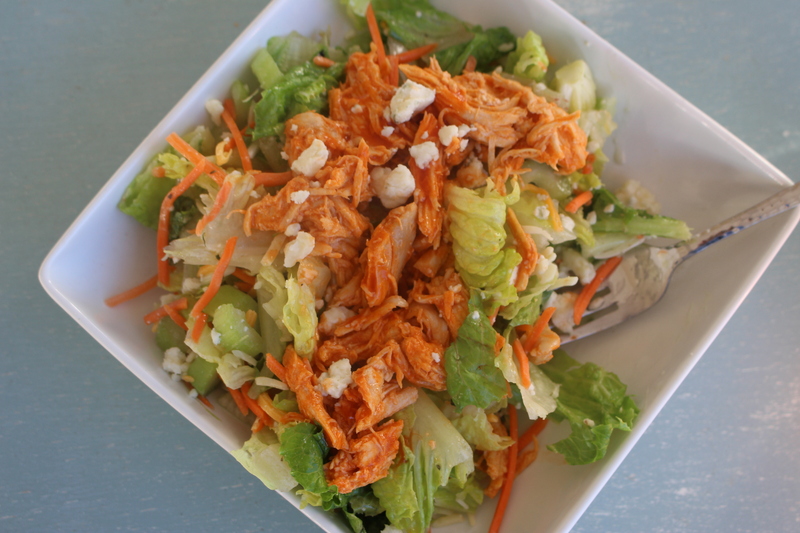 Because I pretty much always, always, always have some shredded buffalo chicken in the freezer, as well as lettuce, carrots, celery, cheddar and Gorgonzola in the fridge, this is easy and quick to throw together. And probably so much healthier than deep fried buffalo chicken wings too! Enjoy! Evenly divide lettuce, celery, carrots and scallions in salad bowls. Toss bleu cheese, cheddar and a few tablespoons of salad dressing with the lettuce. Top with warm shredded chicken and serve. Line a crock-pot with slow-cooker liner. Place chicken breasts and butter in slow-cooker and pour Frank’s Hot Sauce over. Cook on medium for approximately 5 hours. While in the crockpot, take two forks and shred the chicken, mixing with the juices and sauces. Cook for another hour. 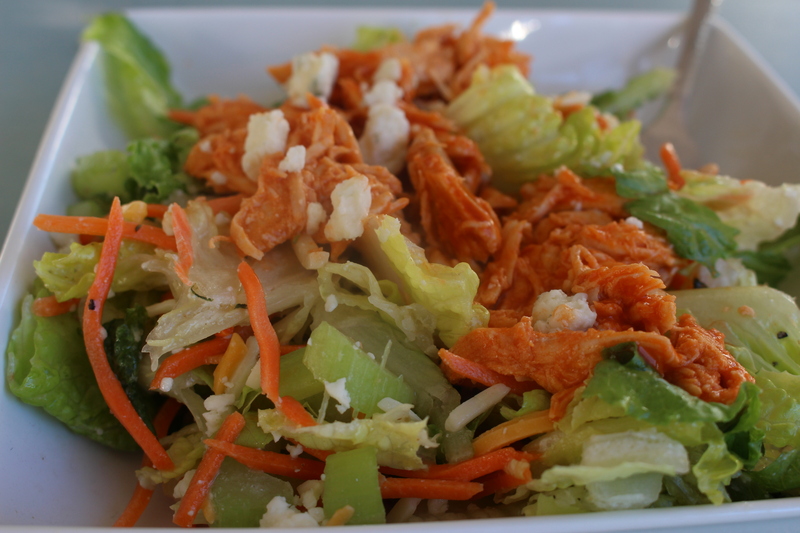 Remove 1 ½ C of shredded chicken for salad. Place remainder in plastic baggies to freeze for later use. Whisk together and set aside in the refrigerator until needed. *I prefer crumbled Gorgonzola. Tubs are easily available at most grocery stores.